According to Batman writer Paul Dini, most TV networks only market superheroes to young boys, and will cancel shows if other audiences enjoy them more. It's always disappointing when our favorite TV shows are cancelled by networks, but realistically, that just needs to happen sometimes. If a series isn't attracting enough viewers to justify its costs, everybody loses money, which in the long term that makes it harder to produce quality stories. The good news is once you get a dedicated fan base established, you could keep the show running until everybody gets bored, right? Not so, says Paul Dini, known for his extensive work in the DC Animated Universe. During a recent podcast with Kevin Smith, Dini noted that popular superhero shows will still get cut if the wrong audience is enjoying their stories. Specifically, executives only want young boys to watch superhero cartoons, and if too many girls are tuning in instead, that show will be put on the chopping block. 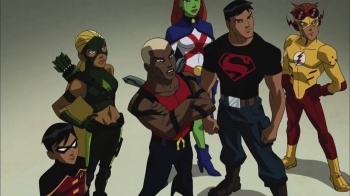 "They're all for boys," Dini said when asked about series cancellations for Young Justice and Green Lantern: The Animated Series. "I've heard executives say this, you know, not [where I am] but at other places, saying like, 'We do not want girls watching this show.'" When Smith asked why female audiences aren't being considered, Dini responded: "They. Do. Not. Buy. Toys. The girls buy different toys. "That's the thing, you know I hate being Mr. Sour Grapes here, but I'll just lay it on the line: that's the thing that got us cancelled on Tower Prep," Dini continued. "'We need boys, but we need girls right there, right one step behind the boys' - this is the network talking - 'one step behind the boys, not as smart as the boys, not as interesting as the boys, but right there.' And then we began writing stories that got into the two girls' back stories, and they were really interesting. And suddenly we had families and girls watching, and girls really became a big part of our audience ... But, the Cartoon Network was saying, 'F***, no, we want the boys' action, it's boys' action, this goofy boy humor we've gotta get that in there.'" I'd never heard of Tower Prep before (because I'm a boy, apparently), but it was getting decent reviews before being cancelled after a single season. The series introduced a group of superpowered teenagers imprisoned against their will at a private school, like a bizarre combination of X-Men and The Prisoner. That actually sounds like an interesting idea, but as Dini notes, Tower Prep was eventually replaced with a show about "goofy nerds fighting CG monsters". But hey, in the Cartoon Network's defense, it's not like female-centric action stories would be successful enough to sell toys, am I right?